How many times can you count when the title character of a book isn’t even in the issue? Right off hand, I can’t even think of any. In this issue, Spidey graces the cover, and that’s about it. It’s all about the bad guys here! We have the Sinister Six that consist of Sandman, Mysterio, Chameleon, Rhino, Electro, and Doctor Octopus. Then we have Intelligentsia, who are M.O.D.O.K., Red Ghost, Mad Thinker, Wizard, and Klaw! Excitement and treachery abound in this issue, and our favorite web head is nowhere to be found? How does it fare? 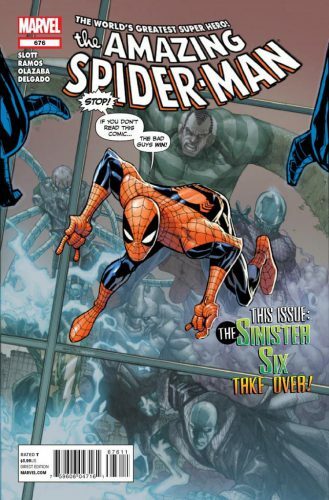 Find out as we review Amazing Spider-Man #676! So, it all starts out in an underwater base where the Sinister Six are trying to keep Doc Ock alive. Mysterio and Electro, with Doc’s guidance, are able to transplant him into this nightmarish machine. Electro calls it an upgrade, Doc Ock calls it his final resting place. He’s more machine than human now, but it’s not his appearance he has on his mind, it’s the complete and utter destruction of Intelligentsia! Intelligentsia has created this weapon called the Zero Cannon. As we see in the issue, it works quite well when it dispatches the Winter Guard, and the ground they’re standing on, right into space. Are they dead? Who knows, but it’s not long before the Sinister Six, with the help of Chameleon (he’d already infiltrated Intelligentsia previously) show up. The battle is on!! Let’s take a look at Dan Slott’s script. It’s not bad. Almost none of the members of the Sinister Six act like what I’m used to. Is that good? Kind of. I’m more used to seeing Mysterio act very eccentric and egotistical. He’s nothing like that here. He almost reminds me of a bad version of Spider-Man. Rhino, though a different person than the original, is more fueled by hatred and rage than anything else. I’m honestly used to him being no so smart and just kind of running into stuff. Sandman is typical, as is Electro. The biggest change for me is Doc Ock. What happened to him? I’ve obviously missed quite a bit. Regardless of that though, what takes place here will have ramifications in later issues. When will that be? Only time will tell. Artwork. OK, Humberto Ramos’ pencils I think are quite well done and greatly suited for this issue at least. It’s over stylized and very animated, and at least here, it suits well. I see lots of scowls and little in the way of emotion coming across the characters, but hopefully, when some of the more human roles are put into effect in later issues, we’ll see some of that. Nothing chaps me more than overly animated facial expressions. I hope that doesn’t come in later issues, but I get the feeling I’m gonna be disappointed. For an issue that is a stand alone, I like that very much. You don’t see those very often, and I’m glad to read one, even if it is just about the villains. It’s a good change of pace for the title and some welcome enjoyment for the reader. Keep this issue as reference because we will see this as the background of something that will happen later. Coming back to Spider-Man and missing the intense Spider Island storyline, an issue like this is welcome for me. I don’t feel left out or lost, and I’m almost excited to get into the new storyline that’s next. The two parter with Daredevil is looking be to awesome, so I’ll be sticking around for awhile. Get it? Sticking around? Ah, I kill me! Parental Concern: Yellow. It’s good clean villainous fun! Thanks for the review! I had no idea about Doc Ock…interesting. I prefer the art work from the 90s, don’t know why but this animation/ magna stuff is just not my thing. And when it comes to comics? art and story are everything!……. to me anyway. Hey Joseph, when you say the artwork from the 90s. Do you mean the artists working on this book in the 90s or the prevailing style of the 90s. I think McFarlane was the artist on Spider-Man in the 90s. When Joe and I were collecting, the big guys at the time were the likes of Bagley, Jim and Jae Lee, Mcfarlane, Larsen and the like. I think I can speak for him when he’s talking about the style of the 90’s. @Chip: I had no clue about Doc Ock either! When I started reading the issue, the only thing that crosssed my mind about him was how on earth he got to this point! I’m gonna do some digging and find out!